As a historian of Black motherhood, my first response was indeed, Schutz does not know what it means to be Black in America. And even though she knows what it is like to be a mother, she does not know what it is like to be a Black mother. I recounted scholarly debates about motherhood as an institution that has many tenets that are universalizable and universalized, and more specifically, the ways in which “some of the private pains” women experience as mothers are shared regardless of race, color, class, age, culture, time, etc. From concerns and grief felt over an ill child or a child’s death, to cultural and social forces that dictate appropriate ways mothers should respond to what happens to their children, mothers have certain broad experiences and mandates in common. Black and white mothers lose their children but the circumstances of Black children’s death are not the same and neither are the expectations on what maternal grief should look like. My concern extended to how Schutz’s empathy overshadowed Black mothers’ fear, sorrow, and grief and the singularly horrific circumstances under which Black children are killed. It felt dangerous to limit our responses to the suffering of others based on our own “lived experiences.” While hunger is familiar to everyone, Primo Levi, recalling his experiences of the Holocaust, for example, cautions, the hunger experienced in Auschwitz is incomparable to “the hunger of someone who has skipped a meal.” By responding to the experiences of others by likening them to our own, we limit our understanding of the world and perceptions of others. We must therefore go against our nature, against our natural inclination toward empathy based on what we would do if this were to happen to us. Moving beyond empathizing with Till’s mother based on our own maternity is unnatural. However, this is what history as a discipline requires of us. Historical thinking, Professor Sam Wineburg reminds us, is an unnatural act, and it requires us to “go beyond our own image, to go beyond our brief life” to understand the world of others on their own terms. As a historian reacting to Open Casket, I pondered at Schutz’s choice to replicate the image of Till lying in the coffin. Why did she opt against the photograph of Mamie Till-Mobley agonizing over her son’s coffin? Schutz justifies Open Casket as being spurred by maternal kinship with Till-Mobley. Yet the grieving mother over her disfigured son would align more closely with capturing maternal grief. 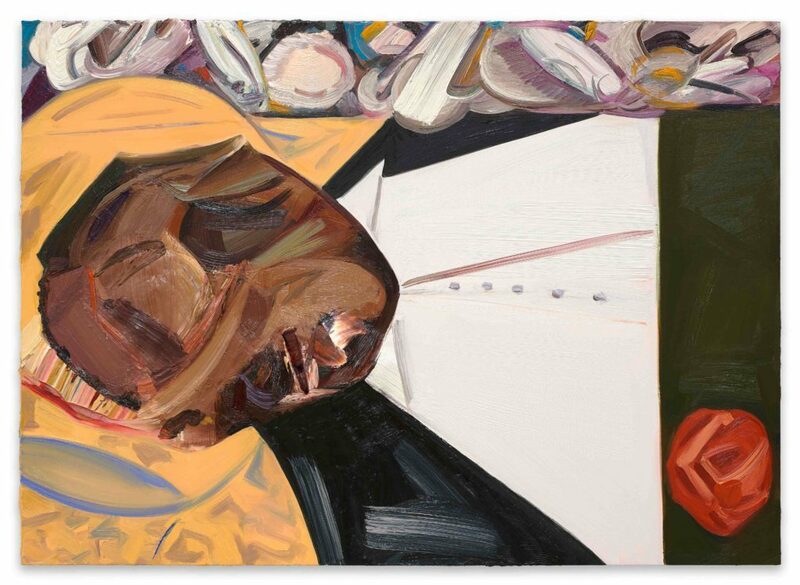 By choosing to paint Emmet Till, Till stood in as substitute for Schutz’s imagined child and in the process also accomplishes “erasure by substitution.” By depicting Till as a dead child that stirs all mothers to empathy, Open Casket alters the peculiarities of the torture and murder of Emmett Till. It sidesteps the question of what maternal love and maternal grief mean under different circumstances. The invisibility of Till-Mobley in the painting further erases the impact of Till’s slaying on Black motherhood. Is it the murdered child that Schutz empathizes with, or the grieving mother? In Open Casket, Black death becomes spectacle and the horror of Till’s death confront the viewer, obscuring Black maternal mourning and maternal grief. The alternative of painting the image of Emmet Till’s mangled face side-by-side with a grieving Mamie Till-Mobley leaning over her son’s coffin in agony would force the viewer to confront both the dead son and grieving mother if not redirect viewing mothers’ full attention to Till-Mobley’s grief. 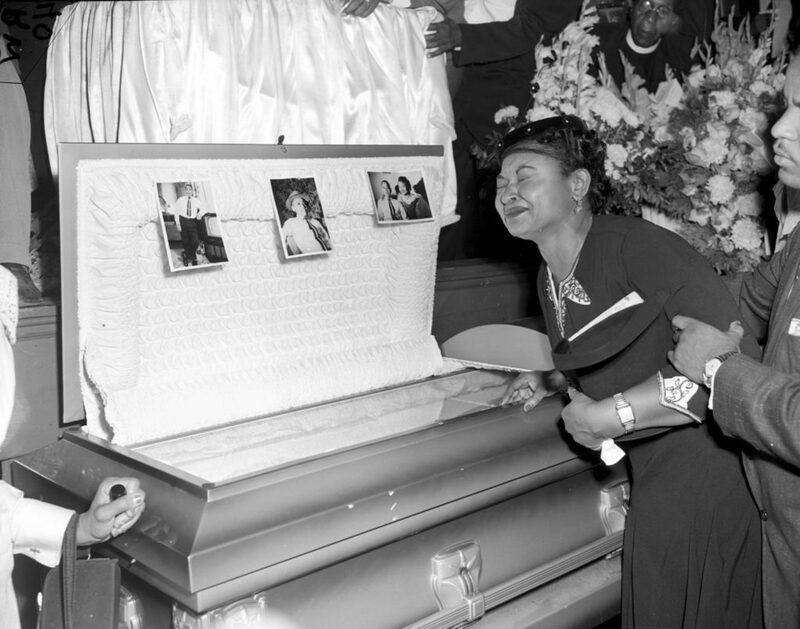 For some scholars, the image of Mamie Till-Mobley standing over her son’s coffin was more iconic than the image of Till’s battered face because it was the first of its kind to capture publicly Black grieving mothers. The image of a grief stricken Till-Mobley ruptured the illegibility of Black maternal grief in the historical record and popular culture. White supremacy exercised its violence not just in terms of physical brutality like murdering Black children, but also in insidious ways like denying emotional ties between Black mothers and their children. Legal principles that underwrote slavery like partus sequitur ventrem – offspring follows belly –enabled slaveholders to disrupt and break apart Black families. The unthinking and continuous removal of children from their parents’ care that limit parent-child emotional bonds denied trauma that forceful and violent separation could elicit. Popular culture stereotypes of Black women as always in a state of anger, aggrieved by one thing or another, Sapphire, further nullifies the legitimacy of Black women’s emotional expressions. The experiences of motherhood as racially neutral undertones Open Casket. Yet as Beloved, Morrison’s novel inspired by the enslaved woman named Margaret Garner who chose to kill herself and her children rather than endure slavery, reveals, the horrors of Black enslavement gave very different meanings to maternal love. Beloved’s protagonist Sethe, the fictionalized Garner, confronted audiences with not just a mother’s unthinking decision to kill her child as an expression of love, but also the haunting grief in the aftermath of the killing. Diverging from the archives, which muted, erased, and dissolved Garner, Morrison “would invent [Sethe’s] thoughts” and offered a broken and conflicted woman inhabiting the historically resilient heroine – Garner. Unlike Garner who was merely a starting point for Morrison, in Open Casket, Schutz, stuck too narrowly to the script. What new insights does Open Casket force audiences to confront, that history, in its rigidity, fail to capture and that one’s narcissism in seeing the world through their own images fail to grasp? Next Next post: How Can I Improve My Credit Score?